This article is part of a fictional novel. Events are not real. Last year’s prep football player of the year, Jacob Stevens, was shot in what police are calling a drive-by shooting. He survived a few hours, allowing his mother and sister to say good-bye, but unfortunately, his father, John, never got that chance as he was unable to reach the hospital in time. Jacob let West Jordan High School to the state football championship last year and already had scouts from a dozen colleges recruiting him. Coincidentally, Jacob’s blood type was Bombay. Bombay is the rarest blood type. A few blood banks had small amounts of Bombay blood, but much of it was stolen a few days ago. It seems that Jacob did not, however, die from a lack of available blood as recent donations had replenished the very small supply of this rare blood. Jacob will be missed by his family and friends and quite missed during the upcoming high school football season. 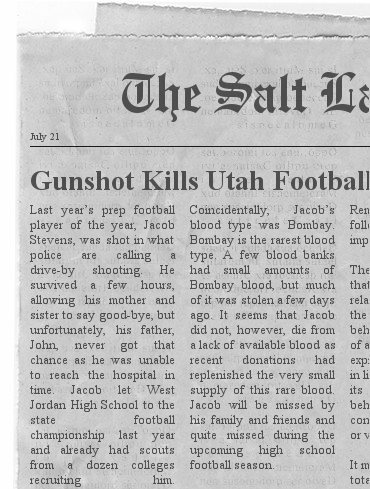 Leave a reply on "Gunshot Kills Utah Football Prodigy"